Asuka-Fujiwara : Archaeological sites of Japan's Ancient Capitals and Related Properties is part of the Tentative list of Japan in order to qualify for inclusion in the World Heritage List. I just wanted to add the Fujiwara part of this nomination. I visited the site in 2010 where the Fujiwara Palace of the Asuka Period used to stand, as shown in the photo. I'd say this is important because the palaces of the kings, Tenno in Japanese, is perhaps the most important in any period. In the Historic Monuments of Ancient Kyoto WHS I do not know why the Kyoto Palace, called Heian-kyo or Kyoto Gosho in Japanese, is not included in the WHS. It's most likely because it is just like the fact that the Jingu in Ise is not even nominated for a WHS, even though it is without a doubt the single most important historic site in Japan by any means: as the Japanese thinking goes, they are so important that they should not be protected by foreign money. The Fujiwara Palace can be most conveniently reached from the Yagi-Nishiguchi train station on the Kintetsu Kashihara Line, four stations north of the Asuka station. From the train station it's about 2 km away. Asuka just screams "rent a bike". Arrive at the appropriately named Asuka railway station and there will be a bike rental place just on the side. This is the best way to see the area because it is a little far to walk but if you have the time it is also possible. There is an excellent tourist map for the area with many features you are trying to find such as stone sculptures and the burial rocks. If you arrive a little late in the day you can also get the bike cheaper (it was offered by the guy, Japan isn't a place to bargain on prices). Once you cross the main road to the east the paths are too small for cars and you will mainly come across other bikes and pedestrians. 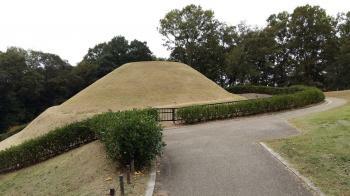 The major place to visit is the Ishibutai Tumulus. There are surprisingly many tourists for something that isn't exactly attractive, has much to look at or is even going to take you more than 5 minutes to explore. I suppose it has a lot to do with the cherry blossom season which makes the area around it beautiful. Overall you can spend a day here if an event takes place at the nearby multi-purpose rest area but half day is enough especially if you take the bike. In the period from 538-710 the Japanese capital was at Asuka, 25km south of Nara. At the time there was no permanent residence of the emperors. With every succession a new palace was built and the court moved. This was due to the believe that the predecessor's spirit remained in the old site. As a consequence, the area is dotted with ruins and burial mounds. In the Takamatsuzuka area (closest to Asuka station) there is a mural museum showing replicas of how it looks inside a burial mound. Please check the official website for more information. The burial mounds are similar to those found in Korea. But this being Japanese, the site being relatively large and the time period not well covered in the current Japanese list, I feel this should be inscribed. Unfortunately, I did not make it to the other Japanese burial mound item on the tentative list, Mozu-Furuichi Kofungun, so I cannot compare the two. 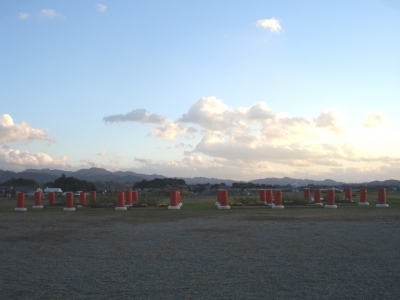 The site is easily accessible on the Kintetsu railway line between Nara and Yoshino (Kii Mountains). 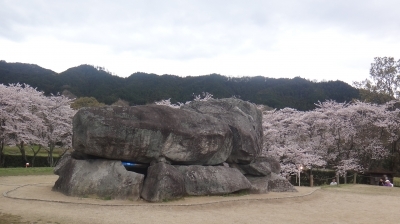 I combined Yoshino and Asuka on a day trip from Nara. Note that this is not covered by the Japan Rail Pass.